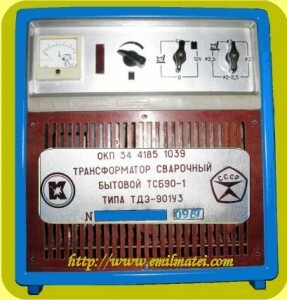 The russian welding transformer type “TSB-90-1U3” is an industrial manufacturing welding equipment. It is designed for manual metal arc welding (MMA), in alternating current, of low carbon steels with thickness less than 3mm, using 2-3mm electrodes. 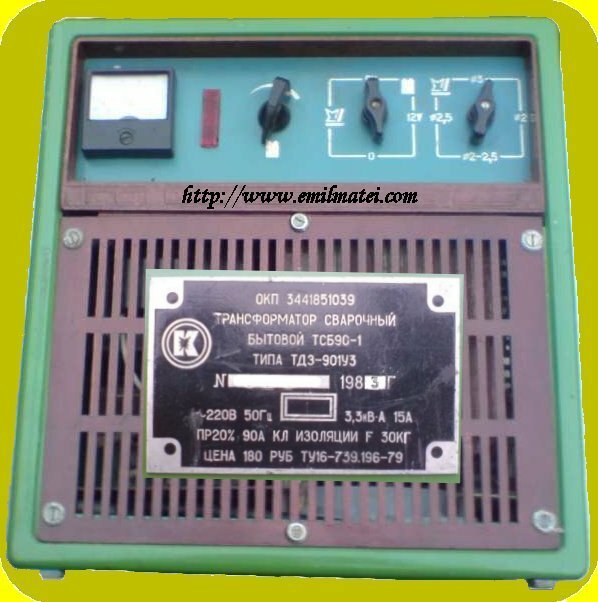 Nominal supply voltage – 220 V.
Maximum idle current – 1 A.
Welding transformer TSB90-1 is distinguished by an original scheme of reactive power compensation. Capacitor C1 is connected in series with the primary winding of the transformer. In the welding process, thies creates a system close to resonance voltage, raising to double the voltage on this winding. 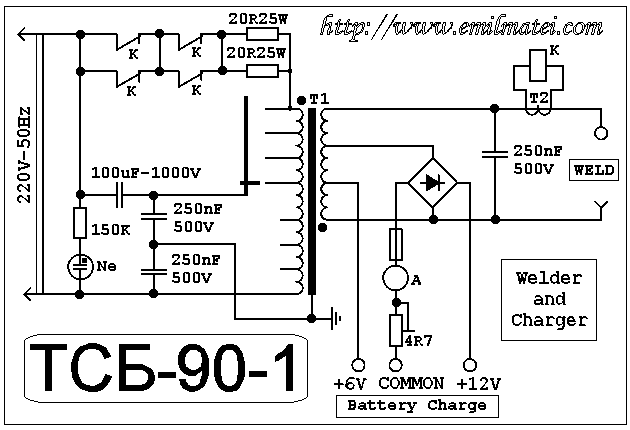 At idle, the capacitor C1 is shorted by resistors R2, R3, lowering down the output voltage to a safe value (under 42V). 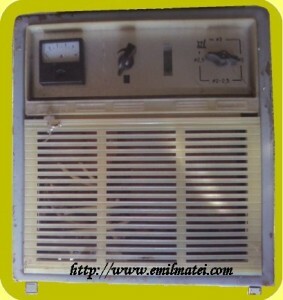 This is a not dangerous voltage from the point of view of labor protection . 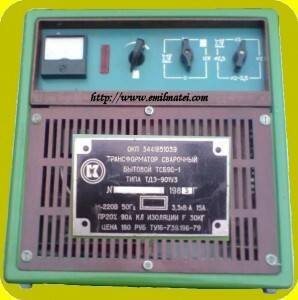 At presence of welding current, the K1 relay, mounted on the current transformer secondary T2, is actuated. Its 4 relay contacts open, so the resistors R2, R3 are disconnected from the circuit, activating the oscillating circuit. 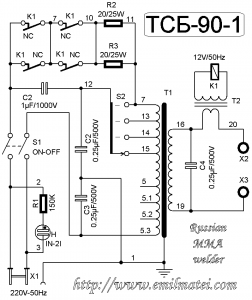 Capacitors C2 and C3 are used for suppresion/filtering. Their purpose is to decrease specific electromagnetic disturbances (RFI). 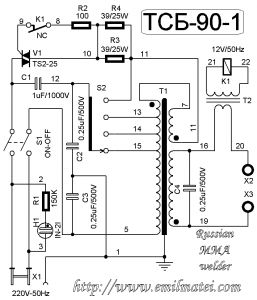 An upgraded version, which considerably reduces the current through the contacts of the current relay, uses a gate-controlled triac through one of the relay contacts. 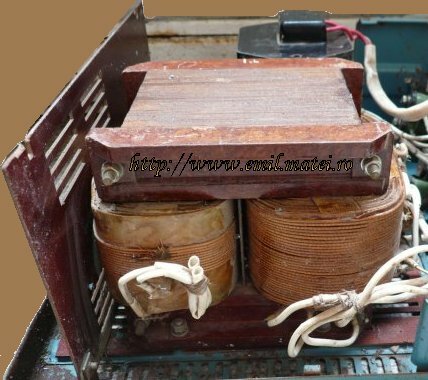 The transformers presented above, are also used for charging the battery voltage of 6V and 12V. 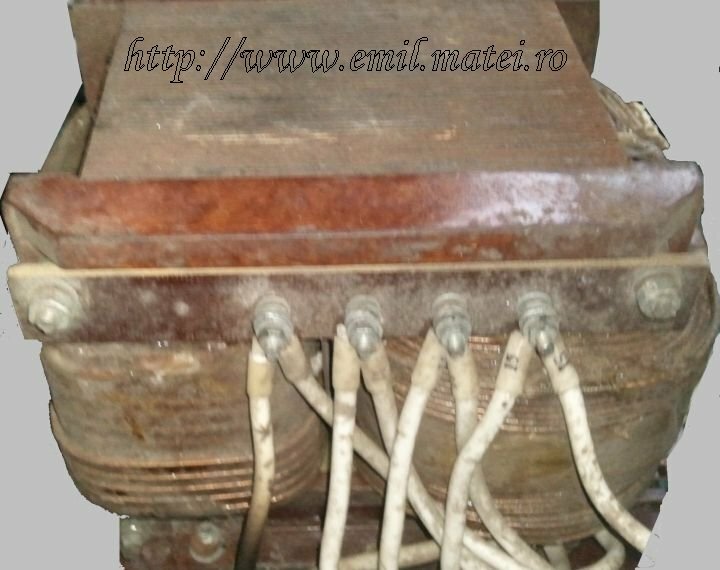 (welding transformers incorporates a battery charging rectifiers). 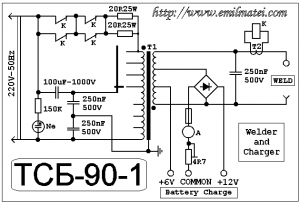 Control limits the charge current, in the range of 6V are 0,7-3 Amper. 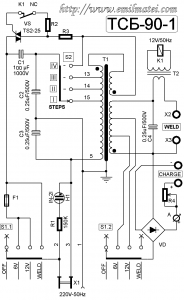 Control limits the charge current, in the range of 12V are 1,5-6 Amper. 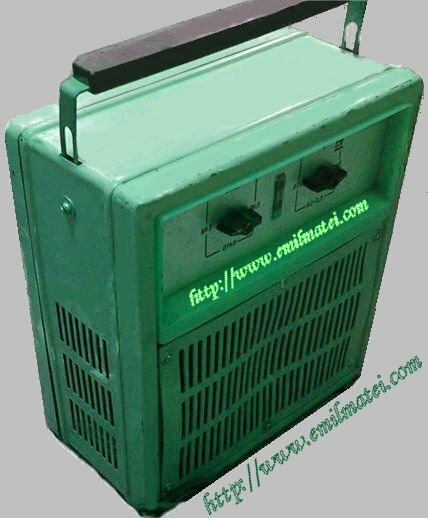 There are some Russian welding transformers which also incorporate a battery charging rectifier. Below are a few versions. 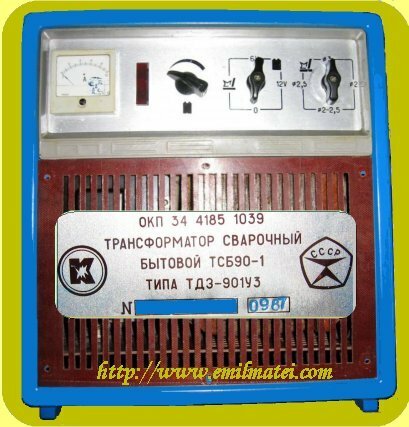 Transformer TSB-90-1 type TDZ-901U3 is designed for manual arc welding with alternating current in a conditions of low carbon steels with a thickness of 3 mm electrode diameter of 2 to 3 mm, and for charging the battery 6 Volt and 12 Volt with the charge current does not over 6 A.
U3 – climatic version and category according to Russian Standard GOST 15150-69. In confined spaces with natural ventilation without artificially controlled conditions. 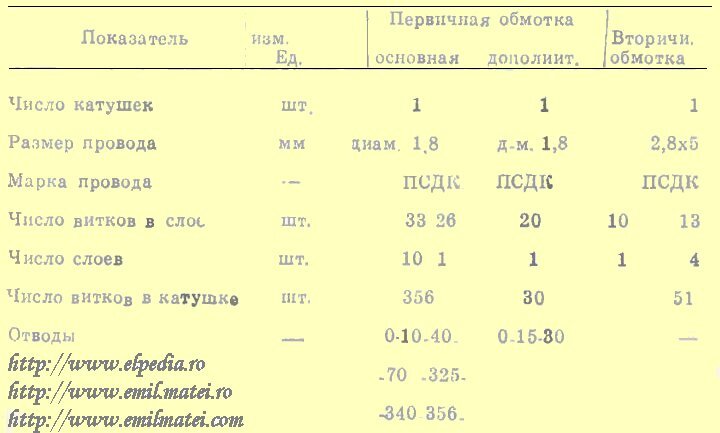 – Altitude of 1,000 m max. – Ambient temperature -40 to 35 ° C – during welding and from -5 to 35 ° C during charging. – Maximum relative humidity more than 70% at a pressure of not more than 133.332 kPa (1000 mm Hg. cent.). 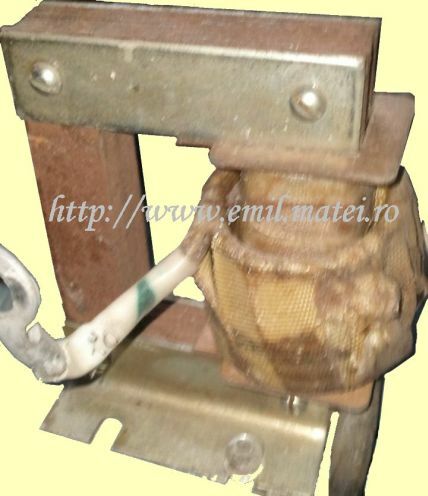 – Tolerance of the room is more than one of the signs that create an increased danger: Damp or conductive dust, continuous high temperature over 35 ° C.
The possibility of simultaneous touch a person to have a connection to the land metalworkers buildings mechanisms on the one hand and the metal frame of the welding transformer on the other side. Safety requirements of GOST 12.2.007.8-75. 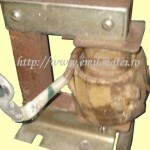 Transformer meets the requirements of TU 16-739.196-79. 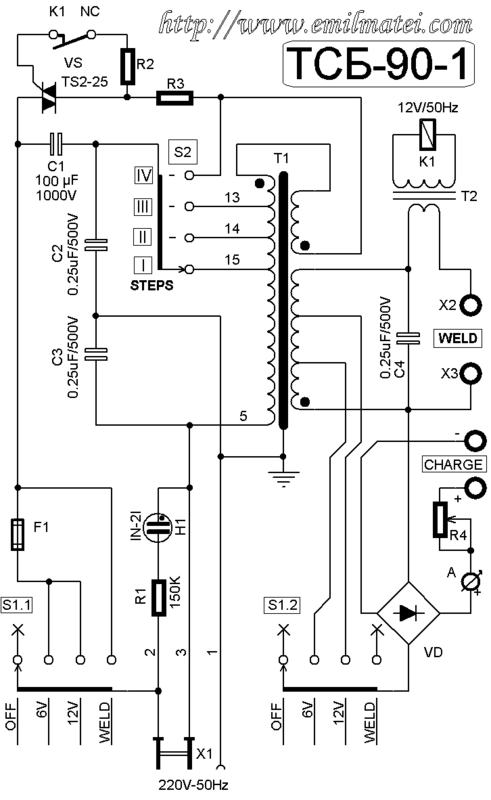 Range of charging current, in range 12V – 1,5-6 Amp. Charger voltage at nominal value of the rectified voltage,in the range of 12V – about 15 V.
The ground transformer is a metal frame, which includes: a transformer,capacitor panel with elements of automation, control panel with mounted measuring instrument control charge current indicator and mode switch welding, located on the wall with her clamps to connect welding cables, cord power outputs for connecting wires to charge and fuse cover with decorative cover. 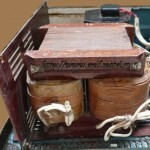 Transformer consists of a magnetic core, primary and secondary windings. The primary winding is tapped to provide a step of welding current, the secondary winding – for receiving and removing the welding current during welding implementation. Primary winding of the transformer in conjunction with a capacitor forms a series circuit with a natural frequency close to the frequency of the mains. Depending on the requi red welding current is switched capacitor with a switch to the appropriate tap of the primary winding. At the start of welding (ignition) relay contacts are open, and when the arc is broken (stop welding) contacts close. Transformers provide a steady burning arc. It is a development version (1) by adding Section battery charging. It is a development version (2) by adding Section battery charging. 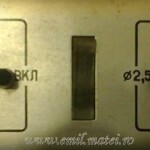 Sunt din Bucuresti si doresc sa stiu de unde pot achizitiona un condensator de 100uf la 1000v , pt. aparatul de sudura rusesc TSB-90-1 version 3, cu incarcator auto. 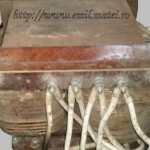 Am citit pe elforum comentariile dvs. 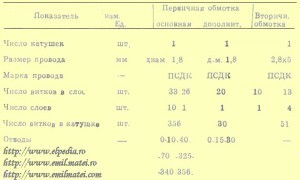 despre aceste aparate si as dorii sa reglez si sa curat contactele releului care sunteaza condensatorul C1, de 100uf.